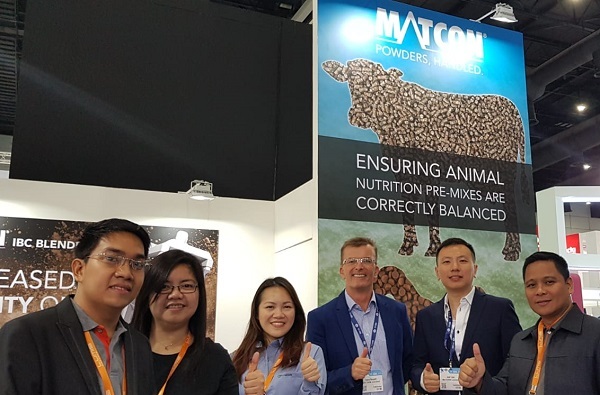 In March 2019 the Matcon South East Asia (SEA) team attended the VIV Asia exhibition in Bangkok, providing powder handling advice and expertise to suppliers of Animal feeds and nutrition products. VIV Asia, attracted over 1,250 international exhibitors and around 50,000 delegates from all over the world to discuss the latest innovations and trends in animal nutrition, supply chain and production. The event therefore bought together many premix and animal feed manufacturers who are looking to improve production efficiency, widen product portfolios and increase output without compromising on quality. Trace-ability and batch control – to increase quality assurance as many manufacturers work across regions, using multiple suppliers. Cross-contamination – to reduce the risk of contamination across batches and recipes without experiencing unnecessary downtime. Reducing the cleaning time of fixed mixers – to increase productivity, removing the amount of downtime being suffered in between batch and recipe changeovers. Reduction of labor costs – to find more efficient manufacturing methods that do not rely on manual operation. 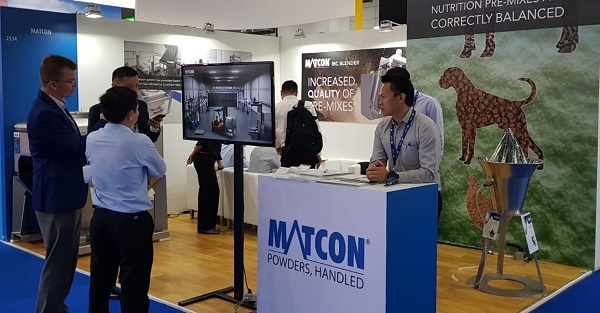 Following the event, the Matcon SEA team will be following up with site visits and working closely with manufacturers as they embark on new projects and developments.